MATRIX M-STAGE HPA-3B HIGHEND KOPFHÖRERVERSTÄRKER VOLLSYMMETRISCH - CLEAR Components - Hifi & Highend Zubehör zum TOP Preis! The M-STAGE HPA-3B is a new member of the M-Stage series headphone amplifier, who is the first one full-balanced design of the headphone amplifier, both supports single-ended output and differential output, maximizing the performance of the headphones. The M-STAGE HPA-3B full-band of THD + N less than 0.0003%, SNR up to -114dB, bandwidth not less than 140k at -3dB gain, 0.4Ω, three gain level options to fit for the different impedance and sensitivity headphone, all of these excellence performance improvements to be born the brand new HPA-3B! 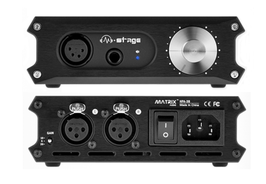 The M-STAGE HPA-3B is both a balance headphone amplifier and a single-ended headphone amplifier, can input the single-ended signal via accessary XLR converter. The M-STAGE HPA-3B excellent structural design to quickly dissipate the heat of power transistors via the shell, full symmetric circuit layout, fully differential signal path amplification, driver stage is the precision constant current source, the precision quadruple potentiometer volume control, so that the HPA-3B has better dynamic range and details than a single-ended headphone amplifier. The M-STAGE HPA-3B alps customizes model of volume potentiometer, Wima and Nichicon audio grade capacitors, Noratel toroidal transformer, precision non-inductive resistance, each carefully selected components make HPA-3B not only presents the perfect sound, but also a more stable and reliable.